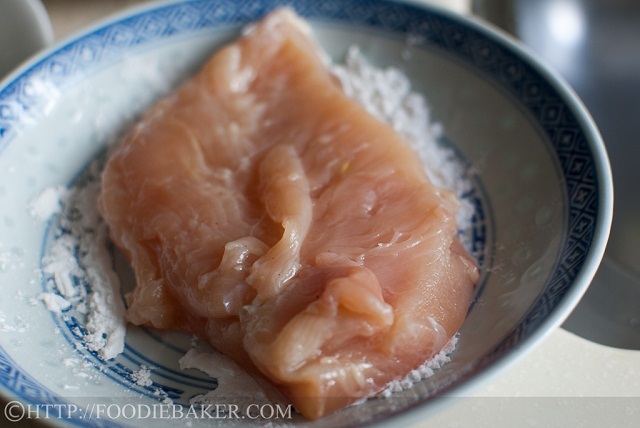 Dredge the chicken breast in flour. 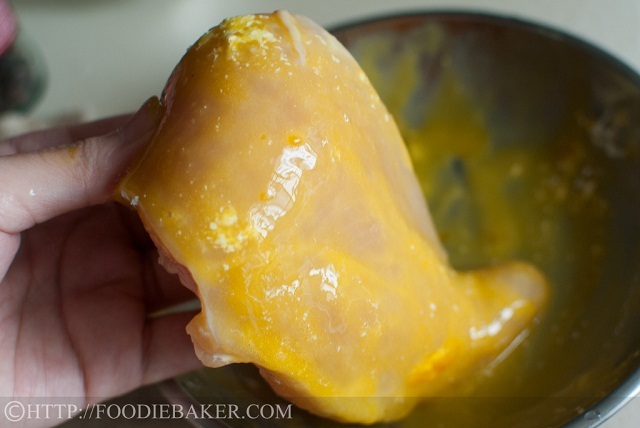 Coat the chicken breast with a beaten egg. Then dip it into seasoned bread crumbs (I used Panko) – sorry for the blurred photo, shaky hands! Bake until almost done and sprinkle some more cheese on top. This is a ridiculously easy and quick recipe and I really have to hand it to Martha Stewart, she’s really amazing to come up with all these easy recipes! 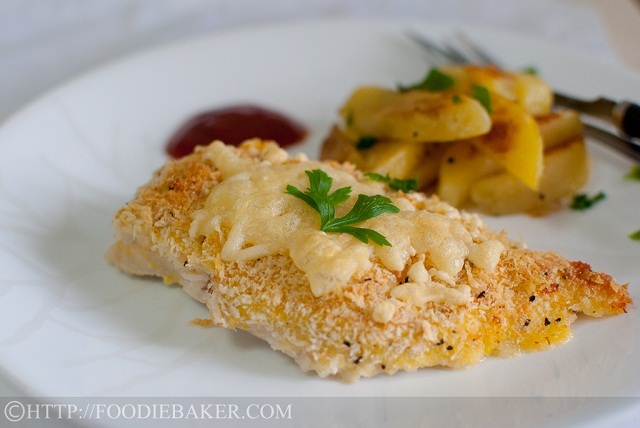 What’s interesting about this dish is that Parmesan cheese is added into the breadcrumbs. There is also an addition of cheese on top – I’m supposed to use Mozzarella cheese but I used Emmental instead as that’s what I had on hand. 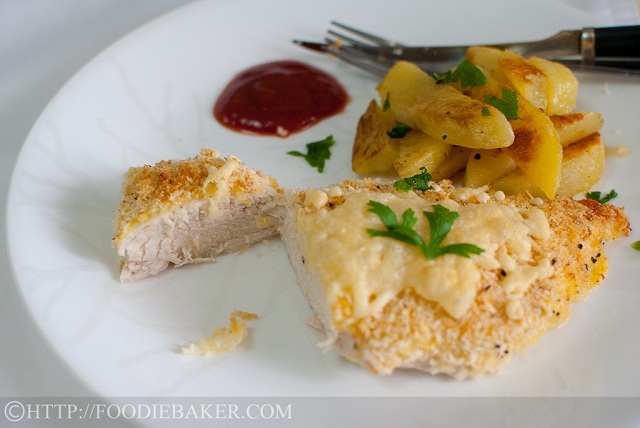 The resulting chicken breast has a sharp, cheezy taste – and because only one side of the chicken is coated in the mixture, the taste is not overwhelming. The only downside is that the chicken breast is a little dry, so I ate it with some ketchup, but overall I’m still very happy with how easy and yummy this dish was. I am submitting this recipe to Cook Like A Star, an event hosted by hosted by Zoe from Bake for Happy Kids, Baby Sumo from Eat your heart out and Riceball from Riceball Eats. Do scroll down to the bottom and see what other bakers/cooks have whipped up! Putting the recipe aside for a while (recipe’s at the bottom), just want to share a little of my views: in the past, I had always thought that there’s no need for fancy presentation of food because they’re all going to end up in my stomach anyway. However, over the years, I realize that the visual taste of food can be just as important as the ingredients in a dish. My interests in food presentation and food photography developed after I started to follow blogs like Tartelette and She Who Eats. Of course, my photos are still nothing compared to them, I have so much more to learn! Because of my new interest in food photography (besides baking and cooking), I started to collect more dishware – in my opinion, a good plate allows the food to stand out and look a lot more appetizing. I am especially fond of ceramic and glass plates, however, good-quality ones can be very costly to obtain! 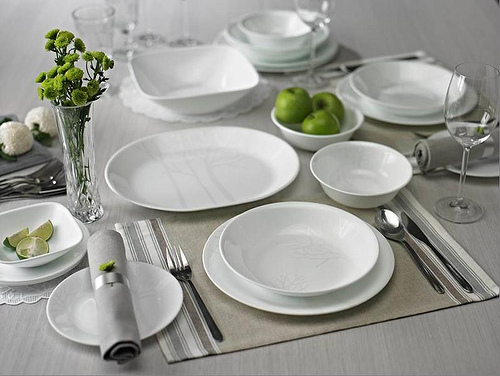 Not too long ago I was very lucky to be sponsored with a set of Corelle® Frost dishware. Corelle® prides itself in manufacturing Vitrelle glass, a tempered glass product consisting of two types of glass laminated into three layers – allowing Corelle® dishware to be thinner and lighter but equally strong as any other dishware. The dishware is resistant to breaking, chipping and cracking, and is also both dishwasher and microwave safe. 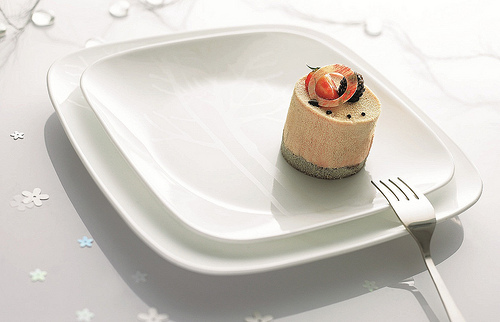 Corelle® Frost is a new design launched only about 2 months back, with a very simple and classic design. I am very surprised by how light the plates are so I went to measure one – a 10 1/4-inch dinner plate weighs only 353 grams! It is also really thin, allowing it to be stored away easily. It is my favourite dishware right now and I’ve used it to serve a few dishes already! For local readers (Singapore): Corelle® Frost set is currently retailing in selected outlets in Courts, Fairprice Finest and Fairprice Xtra. A 20-pc set is retailing at S$320 – it may seemed a little hefty, but a set will definitely last for many years to come, so I’d say it’s very worth it! For overseas readers: I’m not sure if the exact same set is available, but I’ve seen many other series that are equally pretty and desirable as well on the online store! Preheat the oven to 220 degrees Celsius. Line a baking sheet with aluminium foil. Drizzle with a little olive oil and set it aside. 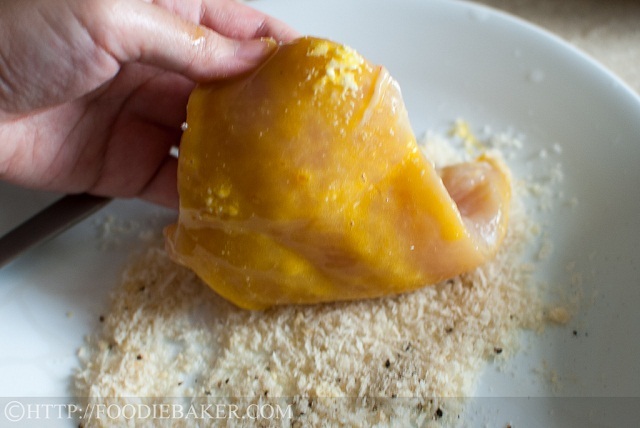 Wash and pat dry the chicken breasts. Place the chicken breasts in between 2 large sheets of baking parchment (or cling film) and pound them using a mallet or a rolling pin until they are of even thickness. Set them aside. Place the cornflour and egg in two separate, shallow bowls. Combine the Parmesan cheese and breadcrumbs in a third bowl. Dredge 1 side (only 1 side!) 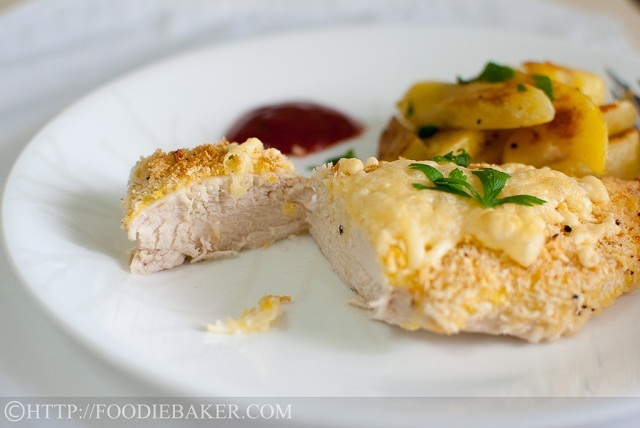 of the chicken breasts in cornflour, egg then cheese-breadcrumbs mixture. Place the chicken breasts on the baking sheet. Bake the chicken breasts for 10 to 12 minutes in the middle rack until the breadcrumbs has turned a beautiful golden brown and the chicken is almost cooked. 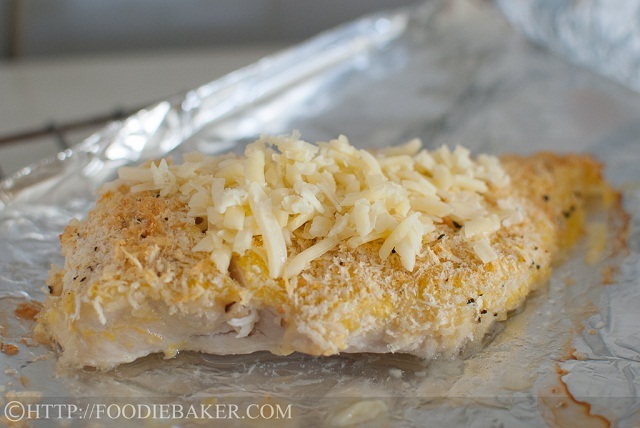 Sprinkle the cheese in the middle of the chicken breasts, shift the baking sheet to the top rack and bake for another 3 to 5 minutes until the cheese has melted and lightly browned. Transfer the chicken breasts onto serving plates and serve with baked fries. 100 posts for 2012! You are amazing. I’m happy that I have 102 posts for last year too. Must be the bake-along, cook like a star and THB… LOL! Always a fan of your food presentation. The plates look only good with your food… LOL! This looks so very delicious. 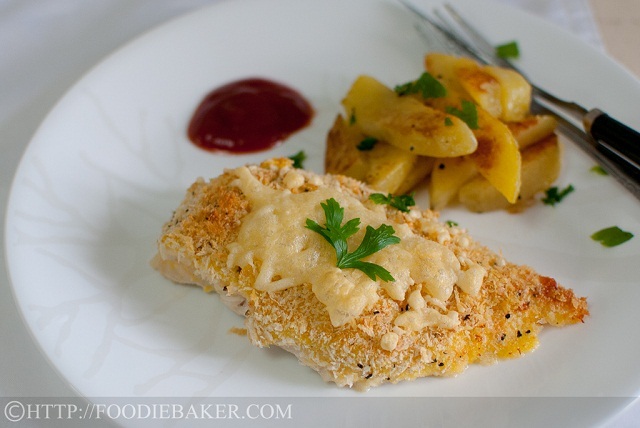 I really like panko bread crumbs, but have not tried it with breaded chicken. I think using Emmanthal cheese was a really good idea. Happy New Year! Cheers to the 100 posts! Hi Jasline, wow… very mouth watering and look soooo appetizing. Nice click. Happy New year to you and all the best to you in 2013. Have a lovely week ahead,regards. When you said it was an easy dish to make, you weren’t kidding, Jasline. And with both crunch and cheese on top, it sounds delicious, too. I have to remember this one. looks like this is another simple and yet great recipe of MS. Besides your superb photography skills that i just mentioned in the previous post, your food presentation is getting better and better! YOu are an excellent cook and baker, a job well done in blogging this year and wish you all the best in 2013, happy new year! Hi Jasline, Happy New Year to you! I like your clean and simple presentation, and your chicken looks good! This looks delicious! Wishing you and your family a very Happy New year! Beautiful presentation. I think white plates are a wonderful palette for so many dishes and, of course, the non-breakable aspects are so handy. A great fast and tasty recipe.